Uncategorized Archives - Page 2 of 46 - Tomatilla! Some friends of mine have launched a new food community site called Foodproof. What does that mean? This is a real social community with membership and blogs, forums, videos, recipes, cross connections and a lot more – and everyone gets access to everything in clever ways so you can make the site what you want it to be. I like the forums, the videos and just the general ambience. Note this is a site for everyone – it is specifically NOT just for foodies – so expect that not everyone will be so sophisticated as to know how to rustle up their own buckwheat blinis with passionfruit and durian cream. Anyway – do me and yourself a favor and go take a look. 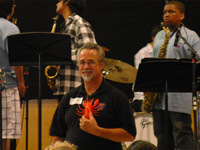 Zippy got down with the beat at the famous Lafayette Summer Music Jazz Workshop for kids. 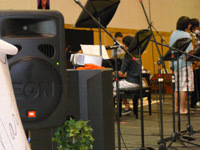 Hundreds of kids came to the workshop from around the country, including New Orleans. It made Zippy’s heart swing with the rhythm of happiness to see all these kids, learning, growing, and joyfully playing together. Here is Zippy on-stage, getting ready to count off the next combo set. 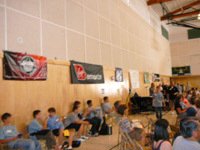 There were 24 small groups of young musicians, showing off all they had learned in the five days of the workshop. Zippy decided that if he makes it back to next year’s Lafayette Jazz Workshop, he’s going to snap his feelers in time to the kids’ amazing improv. Bob believes Zippy can do it, and Zippy has a year to learn how – do you think Zippy can? Zippy’s got a thing for coffee – it makes him even more perky about spreading the word to stamp out pediatric brain tumors. At the Doc Gurley home, Zippy got a special treat – a chance to roast his own coffee. Doc Gurley’s husband is an avid roast-your-own man, and he and Zippy spent a morning bonding over the grill. 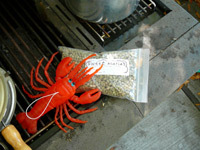 Zippy was surprised how pale and soft the green coffee beans looked -kind of like a lobster after it’s molted its shell. Wow, look at those beans – roasted in a simple modified Jiffy-Pop popper! 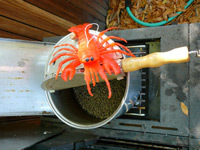 Zippy was stunned at how much smoke and chaff comes floating off the beans as they roast. Now he understands why Doc Gurley hides in the house during the roasting. Zippy smelled like coffee the rest of the day – he kind of liked that. Zippy and the Mister Doc had a bit of a discussion about whose beans these were – both wanted to give them to each other. Then Zippy remembered the best thing to do is share – it doubles the fun. They both headed inside to grind a cup and taste it. It was yummy – and Zippy got jazzed all over again! I am so excited! My sharper-eyed readers will have noticed a little web form thingy over on the right hand sidebar that has three little entry windows that say ‘first ingredient,’ ‘second ingredient,’ and ‘third ingredient,’ with a button below that says ‘Get Recipes.’ Anyone who tried it found out that it did nothing. Now it searches a conglomeration of web sites that let people search recipes and delivers a page of results from those sites – all based on the three ingredients you put in. Go ahead and give it a try! Note that you do have to clear out the fields if you want to put in fewer ingredients – otherwise it will use the ‘first ingredient’ text in the box already and that won’t work out so well. So how does this all work? I am using a Yahoo programming tool for RSS feeds called Yahoo Pipes and then taking the inputs and querying about six recipe sites and then trying to clean up the results to make them unique. Then puting the output out on a simple web page. Let me know what you think…. I’ve used Adsense for adverts on this blog for a couple of years as a way to pay for hosting – it never quite has done that and it has also never really delivered ads that made much sense. And recently it stopped even doing that. Basically if this is what Google is relying on for all that money it supposedly makes then I would sell all my Google stock now (if I had any). Plus Google search is pretty crummy – time to find something better for the search box on the right. So – no more Google ads. Which means no ads (except on the search page where I can’t figure out how to stop them happening) at all. If I find an ad thingy I like I might take them back – and I would certainly consider real ads from real companies I like. Hope you like the less cluttered (slightly) page. Ilva’s Bringing Paper Chef Back! OK, stop whatever else you are doing and rush right over to Lucullian Delights, Ilva’s totally lovely food blog where she is relaunching Paper Chef. I am so happy that she has taken this on and while I will always think of it as my baby I have had to acknowledge that I can’t run it anymore, so I am so very grateful that she has taken it on. We are in the ingredient nomination phase right now – go forth and nominate! Just for kicks – I am going to see if I can get some help. As you may know, I am close to building my wood-burning oven – but it now looks like I may have to come up with a GOOD gluten-free pizza recipe. In this case, good means NOT a batter you spread on a tray as in almost all the recipes I have seen so far. So here is a ‘tag cloud of associations’ and maybe someone will see it and get creative and give me a good idea…. Now that I am experimenting with gluten-free cooking I have discovered one true tragedy. Real bread is an impossibility. Sure there are lots of recipes that SAY they have good bread. But the bottom line is that for REAL bread you need gluten. The gluten is what makes the dough ‘thready’ and that holds it together during rising and after baking. So now it is time to dig into some food science (Harold McGee) and see what I can come up with to fake it. And, no, Xanthan gum is NOT a substitute. The situation is even worse for pizza – all the G-F recipes I’ve seen call for spreading some kind of batter across a pan and then par baking. That’s not a pizza either. So again, another challenge. The other food I feared for was pasta. There are two kinds of pasta. There is the extruded kind that is most often what you buy dried. It is made only of flour and water and is actually harder to make at home. Macaroni is the quintessential example of this. And extruded seems to work quite well for corn, rice and probably lots of other gluten free flours. I recently made a really nice macaroni and cheese with brown rice macaroni from Trader Joe’s. So that one isn’t a problem. But for homemade fresh pasta you are talking about rolled pasta – typically made with egg. And I was worried that it would prove that gluten was a necessary component of the elasticity in this kind of pasta dough. Research provided me with a host of recipes and experimentation proved that bean-based flours were not going to work. Nor was the relatively grainy brown rice flour. So I went with some other things I had tried. Again most recipes called for Xanthan gum so I used it but next time we are going to try it without. The ONLY thing wrong with the pasta I came up with was a bit of a slimy texture – almost certainly due to the Xanthan gum. This pasta I made into taglialini – very fine square cut threads of pasta – a lot like angel hair. I rolled it on a cheap Italian stainless steel hand cranked pasta maker and it did take a little extra work at the thicker stages to develop the dough smoothly. But after that it worked great and I even rolled it one stage thinner than most recipes suggest. without any trouble. Put all dry ingredients in a sturdy bowl and stir to combine. Add the six eggs and olive oil and thoroughly mix, then kneed in to make a stiff dough. Adjust flour if needed or add a little water. Once thoroughly combined, wrap dough ball in plastic wrap and let sit for 30 minutes to rest and then reknead. Break about 1/6th of the dough ball off, rewrap the rest to prevent it drying out and then roll the small piece according to your pasta maker instructions or by hand until very thin (less than 1mm or about 1/16th of an inch. I then cut it using the pasta maker cutting attachment into taglialini. If you want to use it right away, put a big pot of water on to boil as you start rolling. I then made a sauce before cooking the pasta. In this case it was a typical light Italian sauce made by frying 6 finely minced cloves of garlic in 1/4 cup of olive oil along with a sprinkling of chili flakes. I then added 1/2 a bunch of Italian parsley, finely minced and about 2 cups of cherry tomatoes cut into halves and cooked until the parsley wilted. I added a squeeze of lemon. Then I cooked the pasta in boiling water for just under 2 minutes, and served with the sauce and a sprinkling of shredded parmesan. First, Happy New Year to you all! I am determined that this year will be different, better and far more worthwhile. So a lot of changes are planned . I started out with the simplest – no New Year’s Resolutions! In the past they have just been a way to feel guilty. No more…. Next, we are rapidly becoming a gluten-free (as well as often vegetarian) household. It is looking likely that 1.5 of us have celiac disease – possibly VERY badly. Wheat is gone. So is barley. So is rye (not much of a loss that last) and so are most oats (because they always apparently have some wheat byproduct left from the mill). The biggest concern is of course, beer. Fortunately sorghum appears to work and Briess actually has two varieties of Sorghum extract that have the required characteristics to produce beer – mostly rather lightish apparently – kind of like Budweiser only it tastes of something. In fact A-B, the brewers of that foul concoction, actually make the top-selling gluten-free beer (Redbridge I believe) and I have had it and it tastes quite a lot better than Bud. Not brilliant, but not bad. So I have hope on the brewing front. 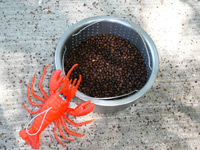 I plan to try additions of dark rice syrup and molasses and roasted non-gluten grains to bring up the taste. So there’s challenge number one. Next up is bread – despite all the many great gluten-free food blogs out there, I sense that the bread (and especially pizza) under discussion is NOT going to cut it. Especially since I amnow committed to the wood-burning oven project. Whatever pizza and bread recipes I come up with have to work in a 500 degree or hotter wood-burning oven. So that’s challenge number two. There are of course things like cakes (especially the famous lemon cake) that will have to be redone, but that sounds more doable, so I have hope. Coffee roasting is going to continue. I really enjoy roasting a new pound every week and a half or so and recently I roasted the best coffee I have ever tasted bar none – no matter what. It was an Ethiopian Yergachefe that I got from More Coffee and it not only had the best aroma, it delivered far more of the taste than coffee usually does. I roasted as usual to the beginning of second crack and got a coffee rich in complex caramel, roasted almonds and complex fruit flavors. It had great depth and also lasted well. I did, however, do one thing different. I dropped a whole cinnamon stick into the coffee before I roasted it and roasted the cinnamon along with the coffee. It added a VERY subtle layer to the coffee as a whole and the layer stayed with it because I kept the stick in the jar with the beans. Once or twice during the week I also broke a small piece off the stick and ground it in with the beans. You can buy cinnamon-flavored coffee commercially but the stuff is disgusting – heavily infused with an artificial flavor (or at least artificial tasting). You can also make cinnamon coffee by adding a small piece of cinnamon stick as you grind regular beans – that is MUCH better. But it is nothing compared to roasting the cinnamon with the coffee. I got the idea many years ago from ‘Seven Pillars of Wisdom’ by Lawrence of Arabia (a really interesting book) and just now got to try it. As I recall, they mostly did it with cardamom, so that’s next to try. So, more coffee roasting is challenge number three – I’ll try to provide roasting and tasting notes – mostly for me so I can figure out what I like best. One thing we did a little of just before the holidays that I plan to do more of is canning. First off, the family and a friend harvested about ten pounds of rose hips from the yard. They then made lots of things, but the one that was best was rose hip syrup – basically boiling chopped rose hips in a big muslin bag with sugar and pectin and then canning the result. It is really fantastic – very much worth the time and effort. They took most of the day and ended up with about 8 pints of rose hip syrup, about two pounds of rose hip tea and six loaves of rose hip bread. I was inspired by their example. We still had about ten pounds of persimmons left from harvesting half of our half of the tree in the back. We had already given away about twenty pounds and eaten another eight or so. But they weren’t going to keep forever, so I peeled them and cooked them down slowly for two hours just covered in water. Then I pureed them, added two pounds of sugar, two lemons cut in halves and a cinnamon stick. I cooked this mixture down for about four hours on VERY low, fished out the lemon and cinnamon and canned it. By that point I had about 8 pints. That was the first project. Next I made some Meyer Lemon Dundee Marmalade. Our neighbours have an infamous Meyer Lemon tree. Let’s just say that after picking 40 lemons I couldn’t tell anything was gone! So what is Dundee Marmalade? First off, British (or REAL) marmalade is less sweet than American marmalade. Dundee Marmalade is then different in that it is made with larger chunks of citrus peel and it is cooked longer, caramelizing the marmalade a bit more. To make it, I juiced all 40 lemons and removed SOME of the excess membranes from inside the left over lemon peels. I discarded all the seeds obviously. Then I chopped all 40 lemon peels into pieces at most a quarter inch square. These all went into a large stockpot with enough water to just cover, two pounds of sugar and all the lemon juice. I then simmered it VERY low for a couple of hours, added another pound of sugar and then added pectin in the form of all the persimmon peels from the butter, carefully wrapped in a cheesecloth package (apples and pears work well for this too, or you can just buy some pectin…). This all simmered for another two hours. I occasionally skimmed foam off the top. Then I removed and thoroughly squeezed out the persimmon peel package. Then I left it all to sit with a lid on overnight (yes) and resimmered it the next morning for another two hours. At this point is was far more brown than yellow, and tasted very marmalady. So I canned it. It was good. So more canning this year – it wasn’t as hard as I thought it would be. Well, Ilva, over at the truly lovely blog Lucullian Delights, has decided to take on Paper Chef so that it doesn’t die out. I’m really happy because she has always been one of its biggest supporters (and one of the best entrants). This way my little monthly event will carry on. For those of you coming over here from her blog or who have no idea what I’m talking about, below is a little potted history of Paper Chef. Essentially it is a little event for food bloggers modeled loosely on the Iron Chef and on Ready, Steady Cook, the BBC cooking show. Food bloggers have a weekend to devise, make and write about some creation that uses the assigned four ingredients. For full details of how it works, see this post that includes the rules.